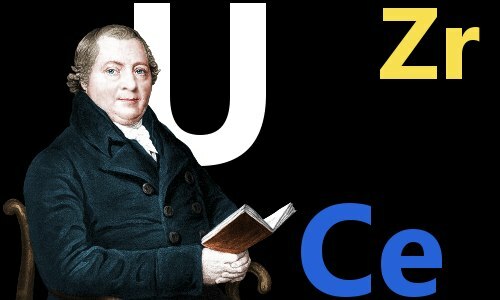 Martin Klaproth discovered the chemical elements uranium, zirconium, and cerium. He verified the discoveries of titanium, tellurium, and strontium, naming the first two of these elements. Was an early analytical chemist who introduced the balance as a standard analytical instrument. Supported Antoine Lavoisier’s controversial (but correct) contention from 1783 that the substance ‘phlostigon’ was fictitious. Like Lavoisier, Klaproth believed the properties of the element oxygen, discovered in 1774, explained chemical behavior more satisfactorily than phlostigon could. In 1789, Klaproth was studying the mineral pitchblende, believed to be a zinc/iron ore. He dissolved pitchblende in nitric acid then added potash to obtain a yellow precipitate. Adding excess potash dissolved the yellow precipitate. Such reactions were not characteristic of any known element. Klaproth concluded he had discovered a new element. He named it uranium in honor of the planet Uranus, discovered in 1781 by William Herschel. In 1789, Klaproth analyzed a sample of zircon (zirconium silicate) from Sri Lanka. His analysis of the mineral’s composition showed: 25% silica; 0.5% iron oxide; 70% new metal oxide. He called the new metal zirconium. A crystal of the mineral zircon. Martin Klaproth discovered a new element in zircon – the metallic element zirconium. Image by Ivan Vtorov. 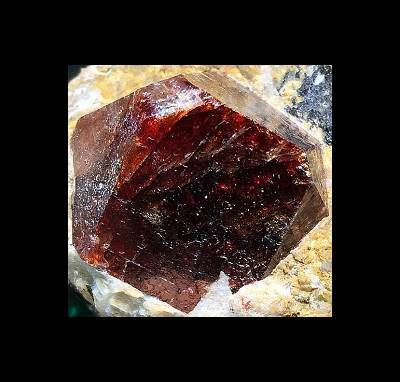 In 1803, Klaproth discovered the new metallic element cerium in a rare reddish-brown mineral now known as cerite. Jacob Berzelius and his colleague Wilhelm Hisinger discovered the element independently, also in 1803. Berzelius named the new element cerium in honor of the asteroid Ceres, which was discovered two years earlier by Giuseppe Piazzi. Martin Heinrich Klaproth was born on December 1, 1743 in the central German town of Wernigerode. He was the third of four children of a master tailor, and he was educated at Wernigerode’s public grammar school. At age 16, Klaproth moved 20 miles (30 km) to the town of Quedlinburg where he became an apprentice in an apothecary – an old fashioned pharmacy. Between the ages of 23 and 28, Klaproth worked in various locations as a pharmacist. In 1771, age 27, he came to Berlin to work as a manager in a pharmacy owned by Valentin Rose. Rose was interested in chemistry, and passed his interest to Klaproth. Unfortunately, Rose died soon after Klaproth’s arrival in Berlin. As manager, Klaproth continued to run the pharmacy, and also took responsibility for educating Rose’s four children for the next nine years. In 1780, age 36, Klaproth married Christiane Sophie Lehmann, the wealthy niece of the eminent analytical chemist Andreas Sigismund Marggraf. Among a number of firsts, Marggraf was the first person to extract sugar from beets, giving birth to the sugar beet industry. After his marriage, Klaproth bought a pharmacy from Marggraf and set up his own laboratory. In 1782, age 38, Klaproth became a lecturer and pharmaceutical examiner for the College of Physicians. His name became well known in medical and academic circles. In 1784, age 40, he began lecturing at the Mountain and Metallurgical Institute. In 1787, he became part-time professor of chemistry at the Berlin Artillery School. In 1788, he was elected to Berlin’s Academy of Sciences. In the years 1789 to 1803, he made his discoveries of three new elements. In 1800, he became a fully salaried chemist at the academy. He sold his pharmacy and moved into an apartment at the academy to pursue chemical research full time. In 1810, he was appointed to the Chair of Chemistry at the newly founded Friedrich Wilhelm University in Berlin. In the years 1795 to 1815, he published Contributions to the Chemical Knowledge of Mineral Entities in six volumes. In 1780, age 36, Klaproth married Christiane Sophie Lehmann. They had one son, Julius, who became a professor of Asiatic languages. In 1814, Klaproth suffered the first of several strokes that would eventually kill him. Martin Klaproth died on New Year’s Day 1817, age 73. "Martin Klaproth." Famous Scientists. famousscientists.org. 2 Apr. 2018. Web. Image of Zircon by Ivan Vtorov under the Creative Commons Attribution-Share Alike 4.0 International license.